Hi Gabriel José de la Concordia García Márquez, kilala liwat nga Gabo (natawo March 6, 1927 ha Aracataca, Colombia) usa nga Colombiano nga nobelista, manunurat hin haglipot nga susumaton, ngan journalista. Nagdaog hiya hin Pasidungog Nobel ha 1982. Apuleyo Mendoza, Plinio; García Márquez, Gabriel (1983), The Fragrance of Guava, London: Verso, ISBN [[Special:BookSources/0-86091-965-2|0-86091-965-2]]. Arenas, Reinaldo (1993), Before Night Falls, New York: Viking, ISBN 978-0-670-84078-6. Bacon, Susan (December 2001), "Review of Conversations with Latin American Writers: Gabriel Garcia Marquez", Hispania (American Association of Teachers of Spanish and Portuguese) 84 (4): 833, doi:10.2307/3657872, JSTOR 3657872. Bell, Michael (1993), Gabriel García Márquez: Solitude and Solidarity, Hampshire: Macmillan, ISBN 0-333-53765-3. Bell-Villada, Gene H. (1990), García Márquez: The Man and His Work, North Carolina: University of North Carolina Press, ISBN 0-8078-1875-5. Bell-Villada, Gene H., ed. (2006), Conversations with Gabriel García Márquez, Jackson: University Press of Mississippi, ISBN 1-57806-784-7. Bhalla, Alok, ed. (1987), García Márquez and Latin America, New Delhi: Sterling Publishers Private Limited. Bloom, Harold, ed. (2007), Gabriel García Márquez, New York: Chelsea House, ISBN 0-7910-9312-3. Cebrian, Juan Luis (1997), Retrato de Gabriel García Márquez, Gutenberg: Círculo de Lectores, ISBN 84-226-5572-1. Douglas, Edward, Mike Newell on Love in the Time of Cholera, http://www.comingsoon.net/news/movienews.php?id=39181, ginkúhà dida han 2008-03-25. Esteban, Angel; Panichelli, Stephanie (2004), Gabo Y Fidel: el paisaje de una amistad, Planeta Publishing. 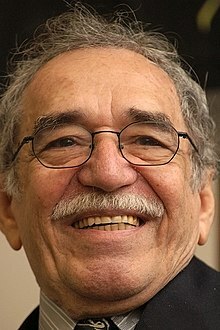 Forero, Juan (October 9, 2002), "A Storyteller Tells His Own Story; García Márquez, Fighting Cancer, Issues Memoirs", New York Times, http://query.nytimes.com/gst/fullpage.html?res=9507EEDC113BF93AA35753C1A9649C8B63, ginkúhà dida han 2008-03-21. García Márquez, Gabriel (1982), "Nobel lecture", in Frängsmyr, Tore, Nobel Lectures, Literature 1981–1990, Singapore: World Scientific Publishing Co., 1993, http://www.nobelprize.org/nobel_prizes/literature/laureates/1982/marquez-lecture.html. García Márquez, Gabriel (1968), No One Writes to the Colonel (1st ed. ), Harper & Row, ISBN 0-06-011417-7. García Márquez, Gabriel (2003), Living to tell the tale, New York: Alfred A. Knopf, ISBN 1-4000-4134-1. Gonzales, Nelly (1994), Bibliographic Guide to Gabriel García Márquez, 1986–1992, Oxford: Greenwood Publishing Group, ISBN 0-313-28832-1. Hernández, Consuelo. "El Amor en los tiempos del cólera es una novela popular." Diario la Prensa: New York, October 4. 1987. Jehensen, Yvonne; McNerney, Kathleen (May 1990), "Understanding Gabriel García Márquez", Hispania (American Association of Teachers of Spanish and Portuguese) 73 (2): 433–434, doi:10.2307/342842, ISSN 0018-2133, JSTOR 342842. Kennedy, William (October 31, 1976), "A Stunning Portrait of a Monstrous Caribbean Tyrant", New York Times, http://www.nytimes.com/books/97/06/15/reviews/marque-autumn.html, ginkúhà dida han 2008-03-24. Maurya, Vibha (January 1983), "Gabriel García Márquez", Social Scientist (Social Scientist) 11 (1): 53–58, doi:10.2307/3516870, ISSN 0970-0293, JSTOR 3516870. McMurray, George R. (1987), Critical Essays on Gabriel García Márquez, Boston: G.K. Hall & Co., ISBN 0-8161-8834-3.
de la Mora, Sergio; Ripstein, Arturo (Summer 1999), "A Career in Perspective: An Interview with Arturo Ripstein", Film Quarterly (University of California Press) 52 (4): 2–11, doi:10.1525/fq.1999.52.4.04a00020, ISSN 0015-1386, JSTOR 1213770. Mraz, John (August, 1994), "Review of Cinema of Solitude: A Critical Study of Mexican Film, 1972–1983, by Charles Ramirez Berg", Historical Journal of Film, Radio and Television 14 (3), ISSN 0143-9685, http://search.ebscohost.com/login.aspx?direct=true&db=ufh&AN=9411104759&site=ehost-live, ginkúhà dida han 2008-03-27. Oberhelman, Harley D. (1995), García Márquez and Cuba: A Study of its Presence in his Fiction, Journalism, and Cinema, Fredericton: York Press Ltd., ISBN 0-919966-95-0. Pelayo, Ruben (2001), Gabriel García Márquez: A Critical Companion, Westport: Greenwood Press, ISBN 0-313-31260-5. Saldívar, Dasso (1997), García Márquez: El viaje a la semilla: la biografía, Madrid: Alfaguara, ISBN 84-204-8250-1. Simons, Marlise (December 5, 1982), "A Talk With Gabriel García Márquez", New York Times, http://www.nytimes.com/books/97/06/15/reviews/marquez-talk.html, ginkúhà dida han 2008-03-24. Sims, Robert (1994), "Review: Dominant, Residual, and Emergent: Revent Criticism on Colombian Literature and gabriel Garcia Marquez", Latin American Research Review (Latin American Studies Association) 29 (2): 223–234, JSTOR 2503601. Stavans, Ilan (1993), "Gabo in Decline", Transition (Indiana University Press) 62 (62): 58–78, doi:10.2307/2935203, ISSN 0041-1191, JSTOR 2935203. Williams, Raymond L. (1984), Gabriel García Márquez, Boston: Twayne Publishers, ISBN 0-8057-6597-2. Martin, Gerald (2008), Gabriel García Márquez. A Life, London: Bloomsbury, ISBN 978-0-7475-9476-5. García Márquez, Gabriel. "Colombian writer Gabriel García Márquez reading the first chapter of One Hundred Years of Solitude" (ha Spanish). Ini nga pakli kataposan nga ginliwat dida han 10:06, 25 Enero 2015.